Louis Alfred (E?) Dubois was the son and third child of Pierre Dubois and Elisa Canet. He was born in late 1860 on the island of Mauritius, his birth being registered in the Plaines Wilhems district. Alfred had two older brothers and would have five younger sisters. His father became the town architect of the capital city, Port Louis, where the Dubois children grew up. When he was a young man of just 18 years old, Alfred's mother died. A few years later his father married again to his mother's much younger sister. So Alfred's aunt Leopoldine Canet, became his step-mother and his father Pierre, would have another family of six with his second wife. It's not known how Alfred was employed as a young man, although later he seems to have turned his hand to a variety of trades. Among the Dubois family's circle of friends were the Collet and Gallanty families (related to the Collets by marriage), who would play a significant part in Alfred's life. The Gallantys were involved in sugar cane plantations, so possibly Alfred and his slightly older brother Oscar (there was only a year between their ages), learnt this trade with them. The major export product of Mauritius was sugar. The impact of the 1869 opening of the Suez Canal had been an acute economic depression in Port Louis. Mauritius lost much of its strategic importance as a trade port of call, along with associated ship repairs and victualling. Many businesses went bankrupt. In the ensuing years the Dubois, Collet and Gallanty families decided to leave Mauritius. Also involved in the plans were Alfred's maternal aunt and uncle, the Suzor family. Alfred came to Australia, but it has not yet been established whether it was before or after his brother Oscar Dubois, with whom he would remain closely associated. Oscar left Mauritius at the age of 22, with family friend, Fernand Collet on the 31st January, 1881, aboard the "Clodian". Just over a month later, they arrived in Victoria on the 9th March, and travelled to Mackay in north Queensland where Fernand's uncle Jean Gallanty was already established. Whilst Alfred would also settle in Mackay, it appears that he may have spent some time in Sydney and was there prior to his family's arrival from Mauritius. So far it has been difficult to exactly establish this, as also living in Sydney at the time was an unrelated Alfred A. E. Dubois born 1868 (family of English descent). The 1885 Sands Directory lists an Alfred Dubois at 78 Crown Road, Sydney, although whether this was the correct person has not yet been proved. Certainly, two of Alfred's maternal aunts came to Sydney around this time so perhaps he was there to greet them. His aunt Mauricia Canet and aunt Lucia and husband Eusebe Clement Suzor, arrived on the evening of the 26th March, 1884, aboard the S.S. "Yarra". Also aboard the ship were a Mr Le Claire, A. Delort and son, A. Anderson, and Eusebe's son from a previous marriage - all names tied to the family at different stages by marriages. His Suzor relatives quickly settled into a house at 55 William Street, Paddington. Sadly, just eight months later, his aunt Mauricia died on the 3rd November, 1884, from a heart condition she'd had for six years. Meanwhile in Mackay, Alfred's brother Oscar, had married Fernand Collet's youngest sister a few months earlier. The rest of the Collet family had come to Australia a few years before in 1882. Oscar Dubois and Ivana Collet were married on the 16th August, 1884, in a ceremony witnessed by her siblings, Fernand and Noemie Collet. New Year's Day, the 1st January, 1885, saw Alfred's father, step-mother and family, arrive in Sydney aboard the steamship "Yarra". 20 Travelling with them was another maternal aunt, Louise Alphonsine Dubois (a widow) and his 15 year old cousin, Louise Anna. If Alfred was not already there waiting for their arrival, evidence shows he definitely joined them a month later. A marriage must have been arranged back home in Mauritius between one of Alfred's younger sisters, Ines Dubois and Fernand Collet. Their wedding was held a month after the Dubois' arrival on the 3rd February, at 597 Dowling Street, Sydney, with E.C. Suzor and A. Dubois being their witnesses. Oscar's new wife was in the early stages of her first pregnancy so possibly they did not travel down for the Sydney wedding. While Alfred later worked with his brother Oscar in Mackay, it appears he may also have lived in Sydney for a few years, where his father and the rest of his family settled. An Alfred Dubois was still listed at 78 Crown Road in the Sands Sydney Directory for 1890. By the 1892 edition, a listing appears at Norton Street, Ashfield, but this is most likely the unrelated Dubois as several of his children were born in the Ashfield district around 1890 and 1891. In 1895, an Alfred Dubois was again listed at 24 Crown Road. A few years later the 1898 Sands lists "Alfred Dubois, confectioner, 347 Parramatta Road, Leichhardt" .. His father Pierre Dubois, was also listed at this same address on the 1899-1900 Electoral Roll. It seems that around the mid 1890s, Alfred moved to Mackay, as his name disappears from the NSW directories. The Qld Post Office Directory for 1896-97 has a listing at Habana for "Dubois Bros., farmers". This was most likely Oscar and Alfred. Within the sugar industry, technology had turned milling into a specialised field. Many large plantations were no longer financially viable and began to subdivide, selling or leasing their land to small farmers so they could concentrate on the processing side of the industry. 31 The majority of canegrowers were now smallholders on less than 90 acres of land. Quite possibly Alfred and Oscar leased a parcel of land at Habana for this purpose. A few years before, Oscar had taken out a lease on 80 acres of land at Nindaroo from the Australian Joint Stock Bank Limited, Mackay. He employed Islander field labourers, contracted from the recruiters Brown & Christie and farmed rattoon cane, paying a royalty to the bank. Rattoon cane was only good for two years after which time it had to be ploughed in and replaced with new stock. It is not known how successful their farming venture was or exactly how long it lasted. The Post Office Directories for 1901-02 list Alfred E. Dubois as living at Petersham farm, Mackay. Around the turn of the century, Oscar's health began to decline but he managed to keep the Nindaroo farm going, possibly with Alfred's help. At the young age of just 42, Oscar Dubois died on the 11th April, 1902, without leaving a will. His funeral left from the home of their brother-in-law, Fernand Collet later that same day. Oscar's burial in the Catholic section of Mackay Cemetery was witnessed by W.T. Paget and A. Dubois. Oscar's wife Ivana was appointed executor of his estate. The last cane crop was allowed to mature, then cut and sold. Alfred was overseer of the three white cane cutters, although the farm had also used Pacific Islander labour as one of the estate's liabilities was listed as "guarantee for Islanders return passage".. Oscar's estate was finalised towards the end of the year and on the 31st December, 1902, Ivana surrendered the lease on the farm back to the bank. What Alfred did in the years immediately following his brother's death is not yet known. Most probably, in conjunction with Fernand Collet, he helped look out for Oscar's family until his sister-in-law Ivana, decided to move her family to Sydney to live near her husband's parents around 1903. During the years that Alfred had spent cane farming, his brother-in-law Fernand Collet had established his own family soft drink manufacturing business in Peel Street, Mackay. It seems likely that Alfred either worked with him or learnt the trade from him. The 1908 Post Office Directory, lists Alfred E. Dubois as an aerated water manufacturer along with Fernand Collet. Whether Alfred traded using his own 'Dubois' branded bottles or worked with Fernand's business is not yet clear. The Directory listings continue up until 1936, some years after both Alfred's death and the relocation of Fernand's business to Sydney, so quite possibly he had a separate business venture. When Alfred was aged about 47, he finally decided to take a wife. His association with the Collets had introduced him to Fernand's cousin, Marie Amelie Regina Gallanty. Also born in Mauritius, Regina was the eldest daughter of Jean Gallanty, and had come to Australia as an infant with her mother and the Collet family. She was 26 when she married Alfred on the 18th December, 1907. 5,2 Despite his late start to married life, Alf and Reg still managed to raise a family of five children. Their first child, a daughter who they named Mary Ena, was born not quite twelve months after their marriage, on the 14th November, 1908. Alfred's father, Pierre Dubois was now 75 years old, frail and suffering from heart problems. He died at his Sydney home from myocarditis on the 17th September, 1909. As several of Alfred's brothers would also suffer from heart disease, this may have been an hereditary problem. His funeral was held just two days later, so it's unlikely that Alfred would have had time to attend. Alf and Reg's own family quickly grew over the next few years. A son, Louis Reginald (named for each of his parents) was born on the 10th January, 1910. Sadly later that same year, Regina also lost her 66 year old father, Jean Gallanty, on the 26th October. He too had been troubled by heart problems for many years. His newspaper obituary stated the Dubois were living at Te Kowai at the time. A few years later, Regina gave birth to another daughter on the 2nd September, 1912, who was named Stella Jeanne, after her late grandfather. The Postal Directory for 1913-14, lists Alfred E. Dubois as living at Byron Street. Another son was born on the 3rd December, 1913, and they named him Thomas Maitland. They appear to have had one last daughter, Ida Laure, who would have been born after 1914. Around 1915, Alfred and his family moved to live in Sydney Street, Mackay, which appears to have been the family's home for the rest of his life. The Dubois would have been living here when Mackay experienced its worst natural disaster when the town was hit by a violent cyclone in 1918. The first warnings were received on Sunday afternoon, 20th January. The night brought high winds of up to 194 km/hr, heavy rain that continued for days and a tidal wave that swept down the river into the town as far as Nebo Road. Buildings were destroyed or unroofed and trees uprooted. Naturally, most of the buildings in River Street (running along the Pioneer River) were badly damaged. The Sydney Street bridge across the river was damaged by several ships striking it, which cut the town off from North Mackay. Hundreds of people were injured and left homeless with 22 killed. It's not known how far down Sydney Street the Dubois' home was and as the street ran adjacent to the river for seven blocks, this would have effected the severity of the damage they experienced. The cyclone destroyed communications and damaged the lighthouse, so it was three days before any outside help reached the town. At some stage, Alfred's widowed mother-in-law, Angele Gallanty, had come to live with them and by September, 1922, she was residing with them. 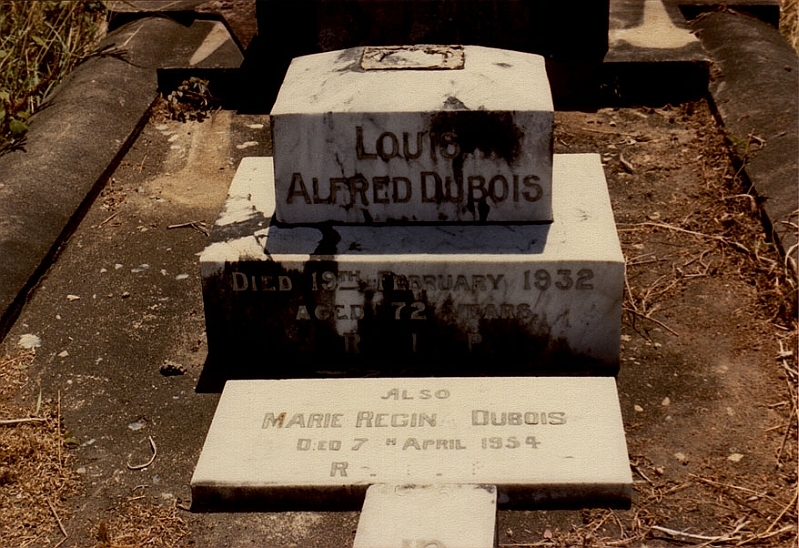 Alfred Dubois died at the age of 72, on the 19th February, 1932, at Mackay, from causes as yet unknown. He was buried in the Roman Catholic section of Mackay Cemetery. Lamb, Karen (2005), History of Louis Alfred E. Dubois , unpublished. The headstone of Alfred Dubois in the Catholic Section of the Old Mackay Cemetery.